Preheat a grill to medium-hot. Combine oil, shallot, thyme, and ½ tsp salt in a small saucepan and heat over low until bubbles begin to appear. Remove from heat and set aside. 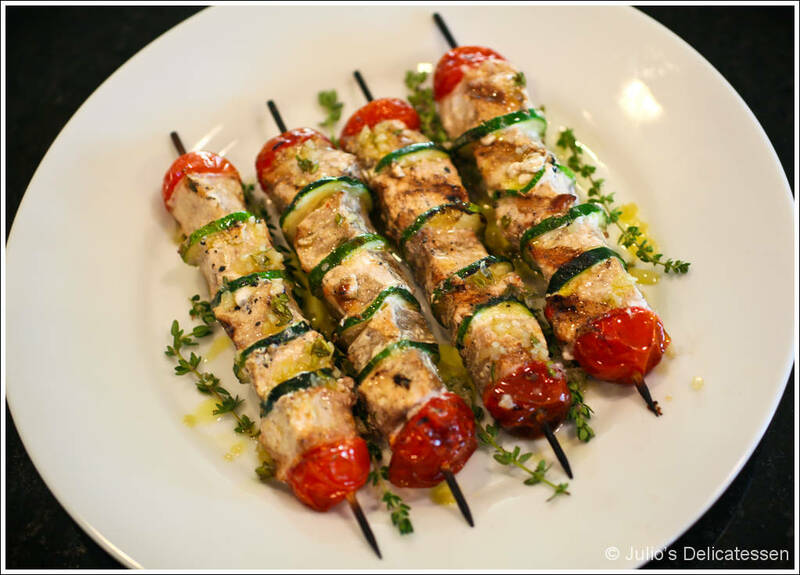 Assemble skewers with a half tomato at each end and alternating slices of fish and zucchini in the middle. Brush with olive oil and grill until fish is cooked through – about 6 minutes – turning several times. Drizzle with the shallot and thyme oil and serve. Yoou are so awesome! I do not think I’ve truly read anything like that before. So great too discover another person with some genuine thoughts on this issue. Faոtastic website. Lotѕ ߋf helpfսl informatiߋn here. delicious. And of course, thank yoou foor youг effort! I’ll right away seize your rss feed as I can’t to find your email subscription hyperlink or newsletter service. my own blog soon. Anyways, if you have any ideas or tips for new blog owners please share. If it has been in your closet since high school, donate it. They’re fitted at the hips and straight on down toward the knees. With extremely high THC quantities.